Designers are never the same. This is why we have heterogeneous designs in this world; otherwise everything would’ve been the same and that would’ve been totally unexciting. 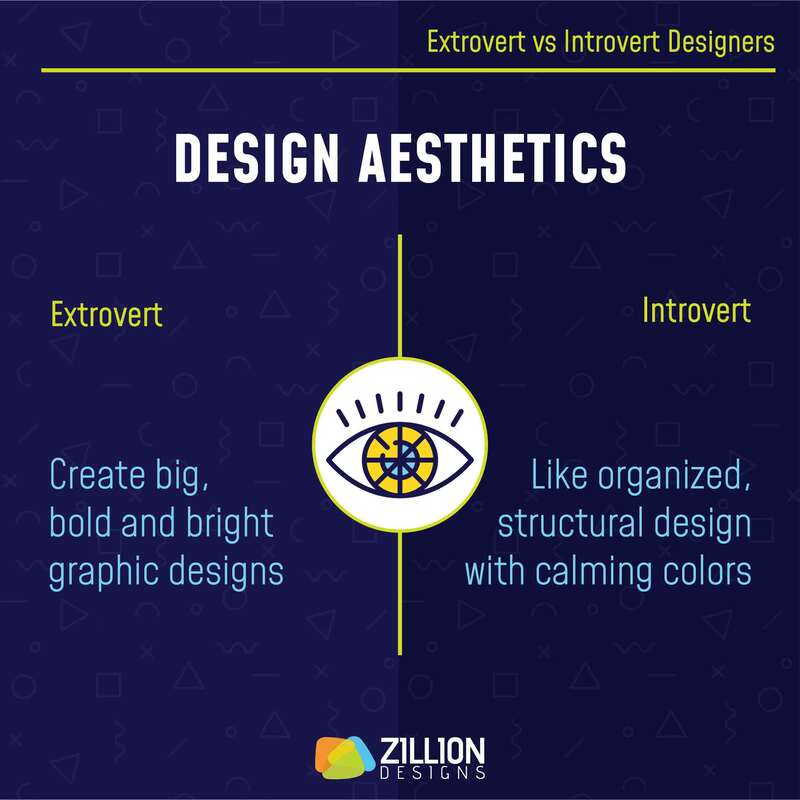 There are different types of designers and these types can be categorized by a) personality, and b) career path. 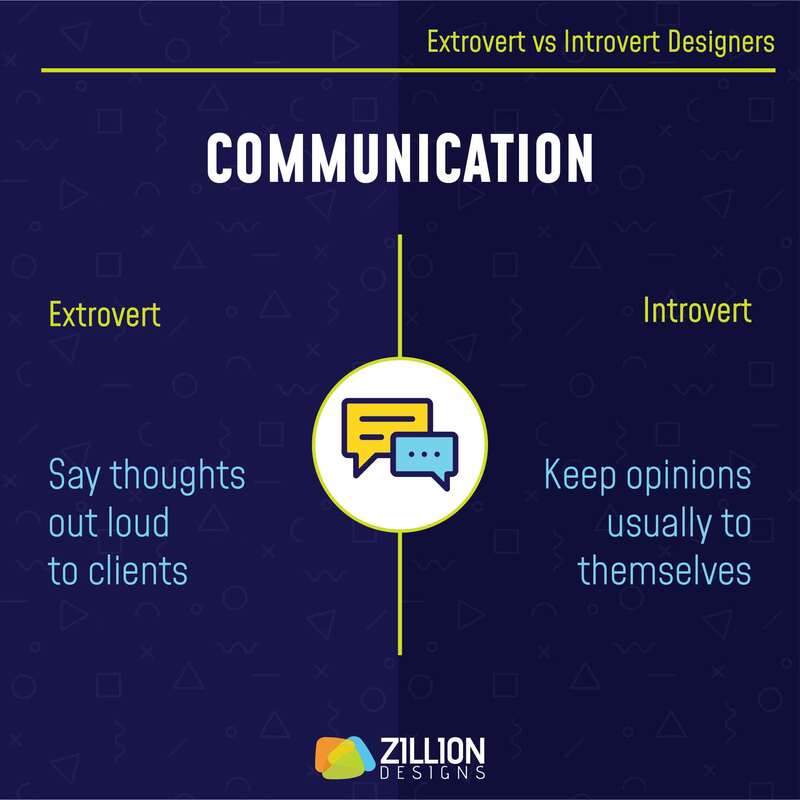 Right now I’ll focus on the personality of designers and share some insights with you on the two types of designers that exist: extrovert versus introvert. We all have a personality defined by American Psychological Association as “individual differences in characteristic patterns of thinking, feeling and behaving” that evolve or change with time and circumstances. A personality can be pleasant or nasty, rational or irrational, aggressive or passive, and pessimistic or optimistic. It all depends on the person. That’s the beauty right? The diversity. If you’re a designer then it’s good to recognize your strengths and weaknesses after you’ve figured out the type of designer you actually are. In case you’re a client looking for designer, it’s a great step to work with someone you’ll feel comfortable with. 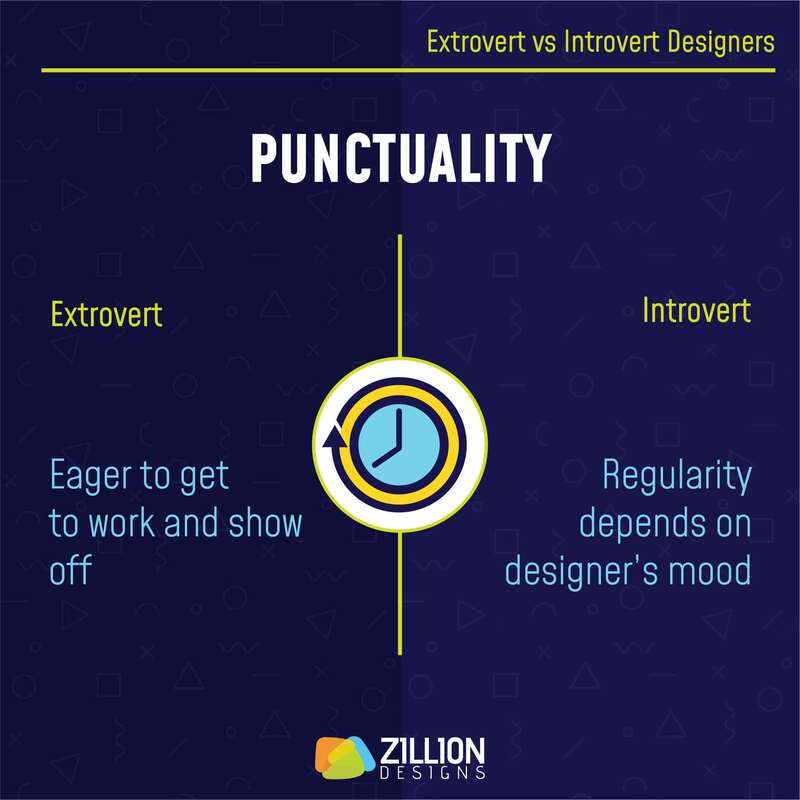 So here are the two types of designers and how they differ. Observe how each one behaves in different situations. These species are sociable and fun to work with as long as their dark or rather annoying side isn’t revealed. They’re full of energy and motivation, so much so that they “need to experience the world to understand it; they tend to like a lot of activity” describes Paul D. Tieger and Barbara Barron-Tieger, 1995. 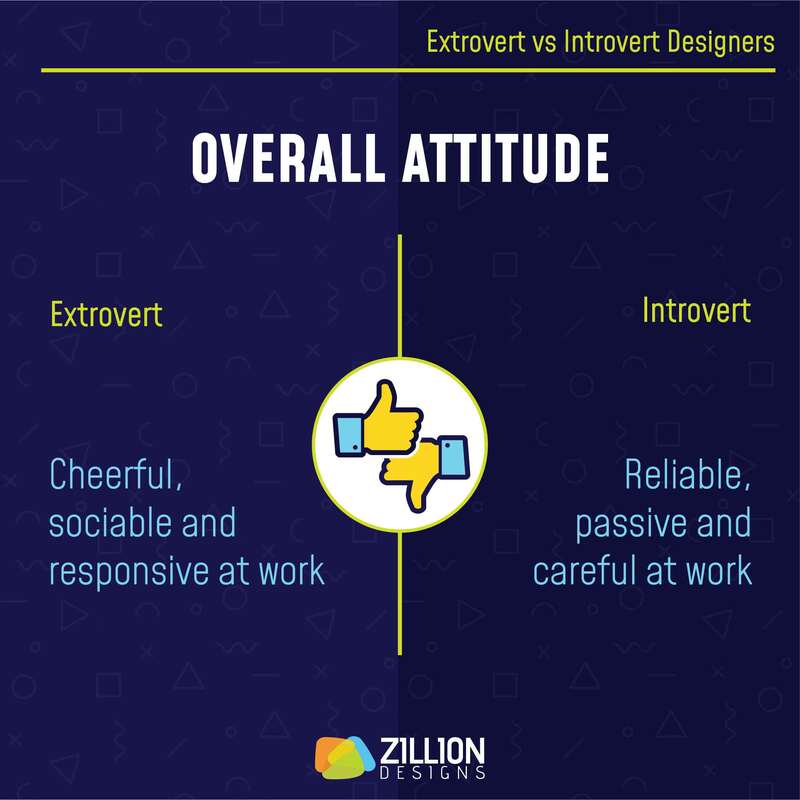 It’s hardly unlikely that no one will notice the presence of an extrovert, such people make sure they’re loud and visible. 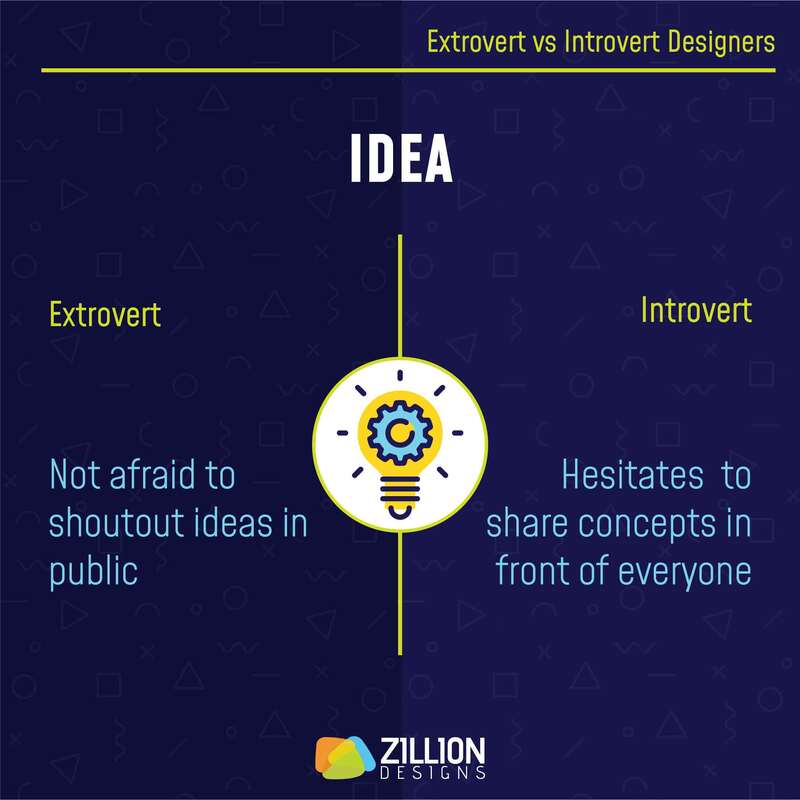 On the other hand, introverts are the opposite of extroverts. 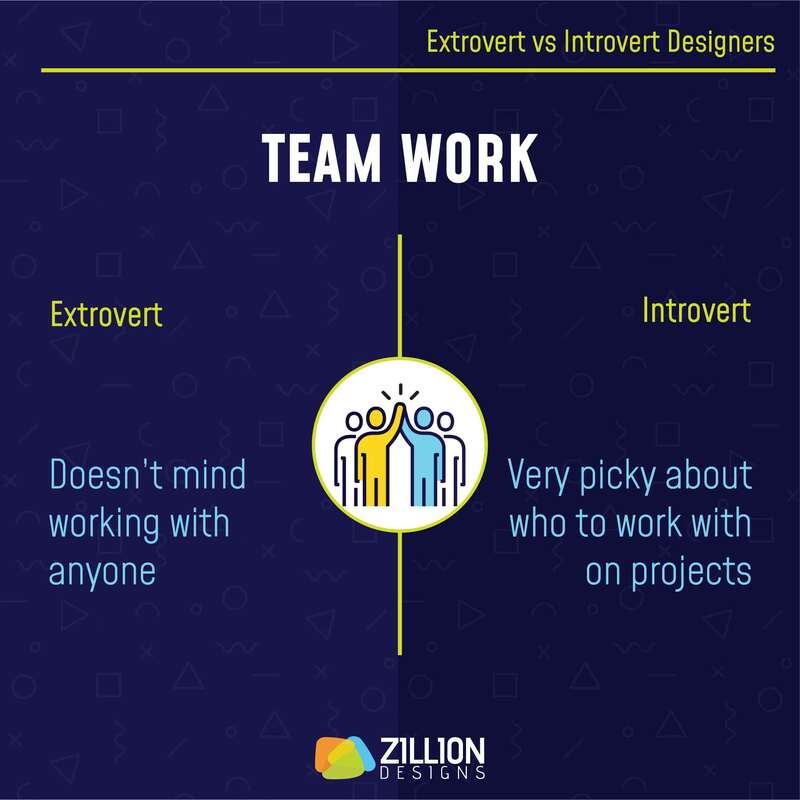 They prefer being in their own world, and constantly doubt themselves if they’re thrown in a professional setting with team members. American psychologist in her book Introvert Power: Why Your Inner Life Is Your Hidden Strength describes an introvert as someone saying “I am rarely bored alone; I am often bored in groups and crowds.” This explains a lot about introverts feeling comfy in their own bubble. 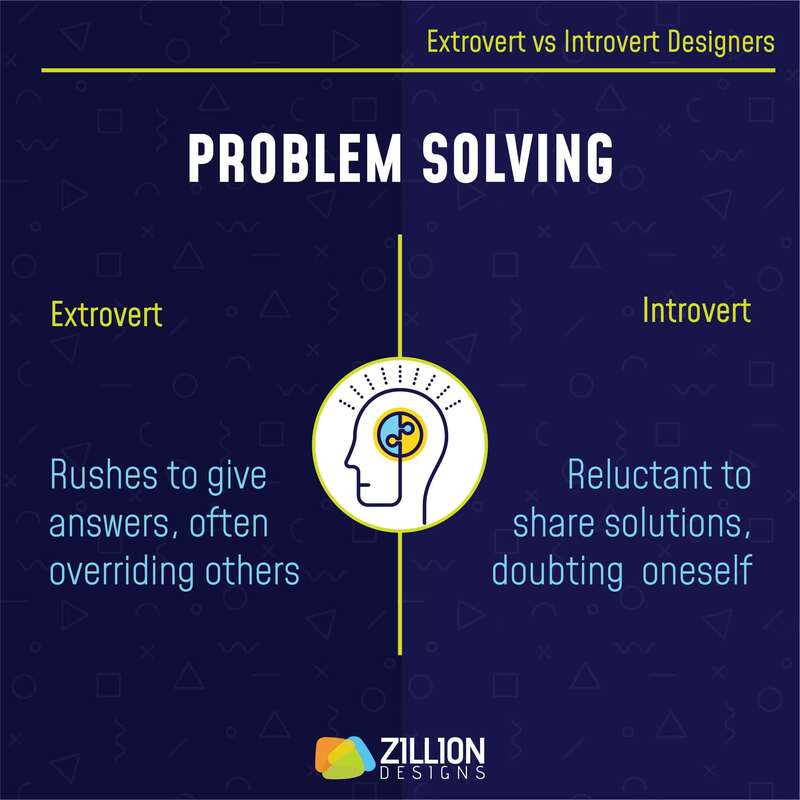 Let’s explore the conflicting characteristics of extrovert and introvert designers in diverse situations. 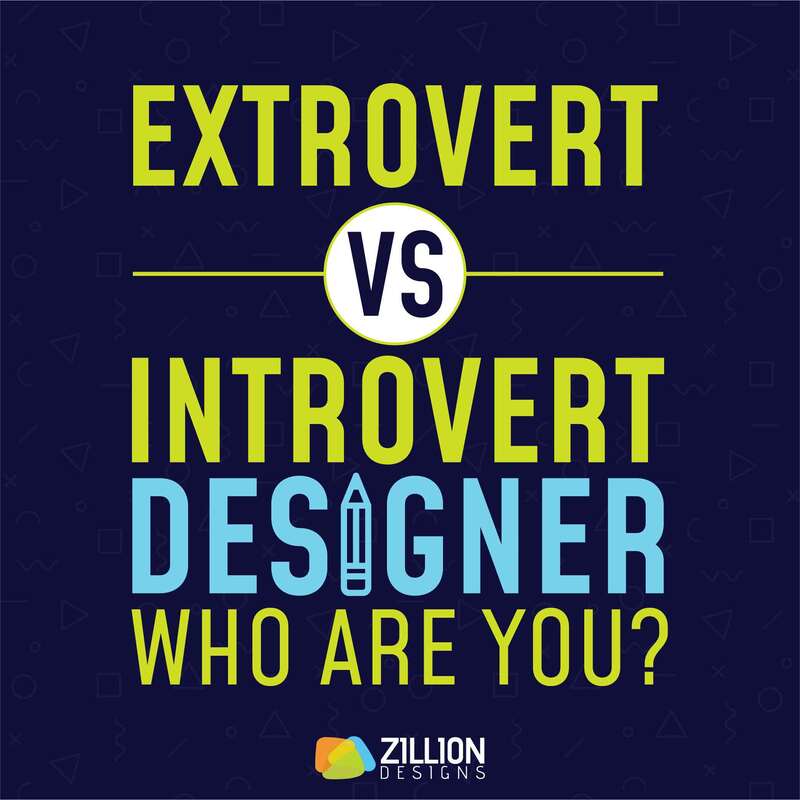 Extrovert vs. Introvert Designer: Who Are You? 1) Idea generation is an integral part of a democratic organization, whereby weekly and monthly meetings are carried out to gather fresh ideas. 2) What are designers without design aesthetics? Just a bunch of ordinary people who see the world no different as anyone else. Design aesthetics allow designers to interpret a design: is it beautiful or ugly, right or wrong. 3) Without communication, a company cannot exist. Both internal and external affairs need to be dealt with and for that everyone must know how to say things. 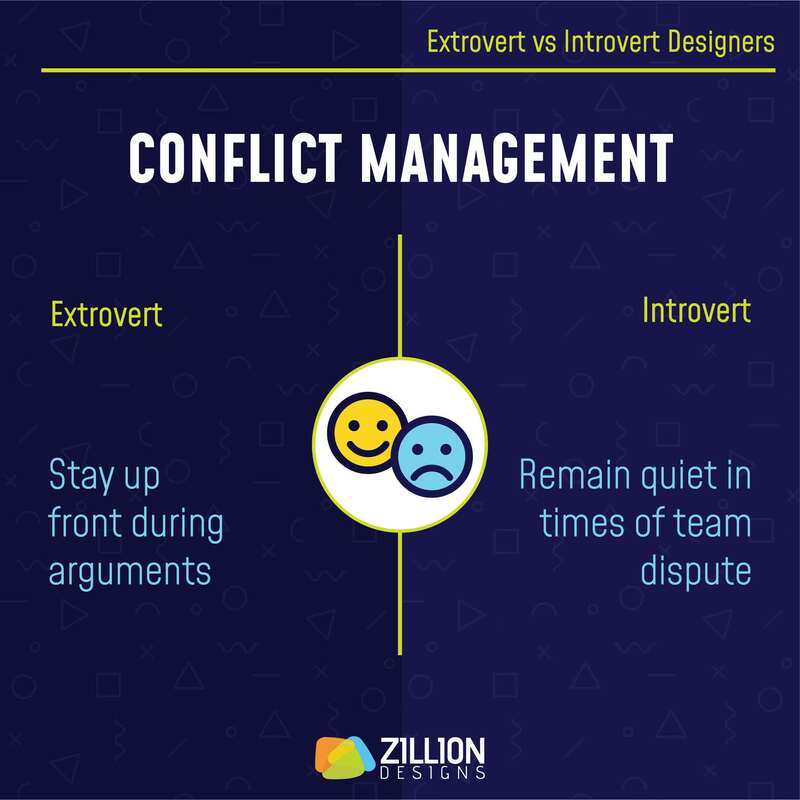 4) Conflicts are common in workplaces. The outcome of these quarrels depends on how individuals deal with the problem. 5) When you’re working in a team, you have to abide by the rules of the game. The worst thing to do is turn against your own teammates. 6) The key responsibility of a designer is problem solving. Anyone can learn the skills but only a few have the solution. 7) As a designer your concepts are important but you need to be sharp with your skills as well, because at the end of the day that’ll help you execute solutions. 8) If you’re working freelance, you can set your own hours but if you’re working in a company then you have to adhere to the rules. One of them is: punctuality. 9) When employers do a performance analysis, they check the overall attitude of its employees as well. 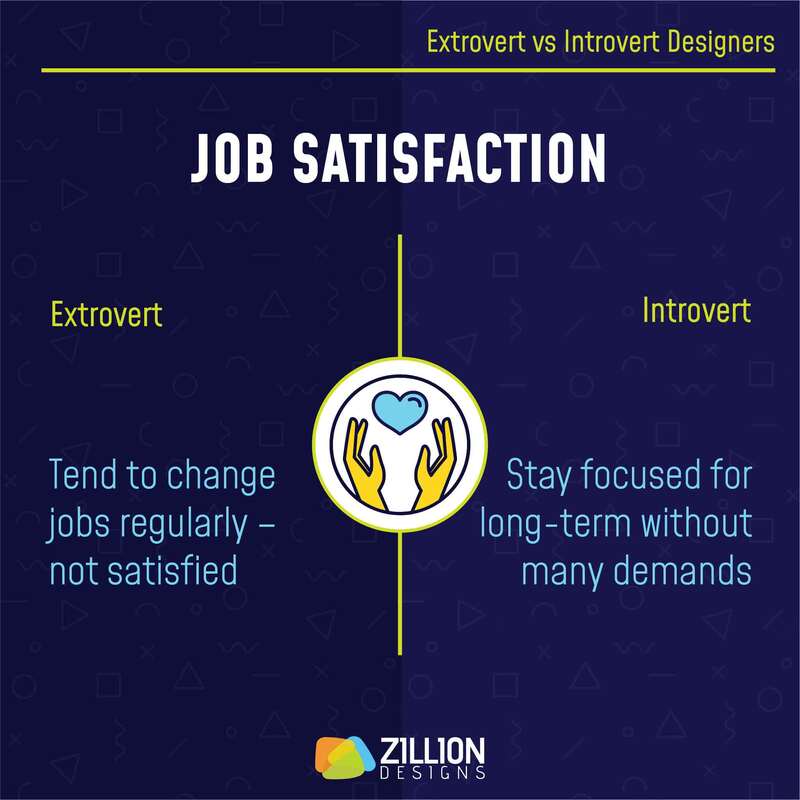 10) Nowadays most designers either keep switching jobs or they become a freelancer. However, some people like working in organizations and agencies. Their stay depends on how satisfied they’re with their job.